We're down to the last few days before Christmas, and I'm so excited! This year I have all of my Christmas shopping already done, and thanks to my mother-in-law, almost all of my wrapping is done too. Usually I'm running—I mean, Santa is running—to Target on Christmas Eve to get stocking stuffers from the bins that have been completely picked over, and then I spend the rest of the night wrapping. But not this year! Also this year I think I FINALLY found something for Soren that will surprise him! So far he doesn't know about it, which is a win, and another win is that I think I picked something he won't return! He is the most impossible person to buy for, besides myself :). Usually he likes what I get him, but it's never quite right, so he ends up returning it and upgrading to the exact specifications he wants. But this year I tried really hard, and I think I bought the exact right thing. Knock on wood. It only took texting with his best friend, chatting with an expert on some obscure website, and spending as much I think Soren would spend to get something that is quality. I also had to delete those texts off of my phone, hide emails, and sneak around to avoid his possible snooping on my phone. On the off chance that he actually catches up on reading my blog this week, I'll have to share the gift itself with you later, but wish me luck! 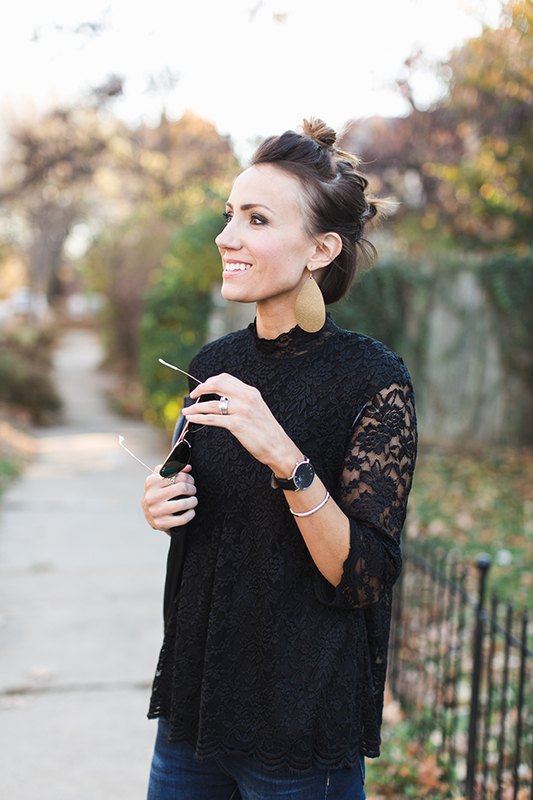 This outfit is my current favorite for Christmas Eve or a date night out with Soren this week—as long as the snow we got yesterday thaws out. 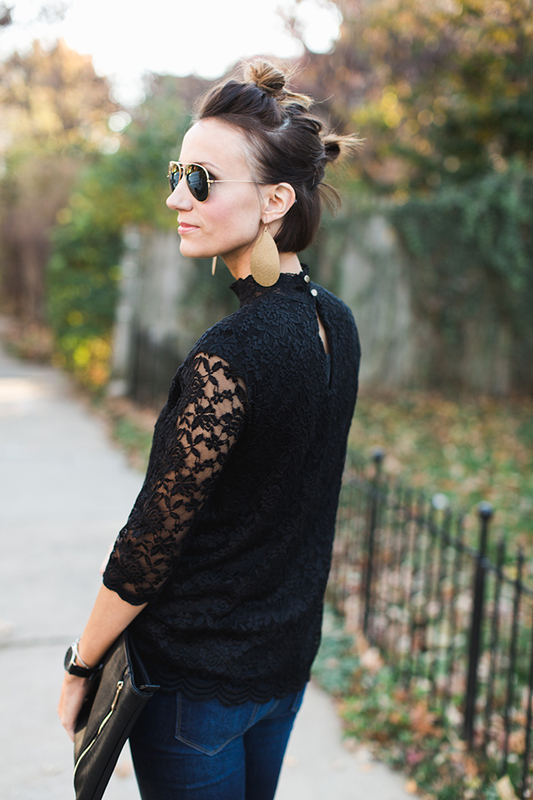 I love the mock neck on this black lace top from Nordstrom, plus black lace can be styled in so many ways, even post holidays. 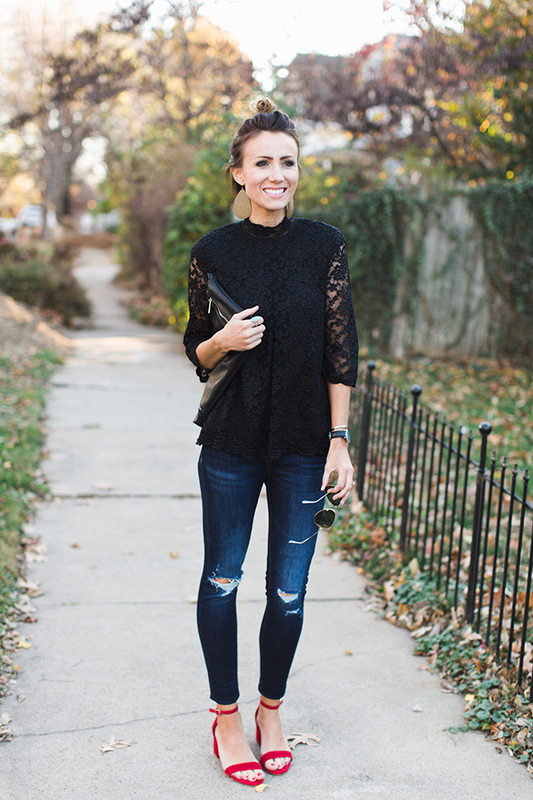 I paired it with this pair of distressed denim because I love pairing edgy rips with something feminine like lace. It's unexpected and adds interest to an otherwise predictable outfit . 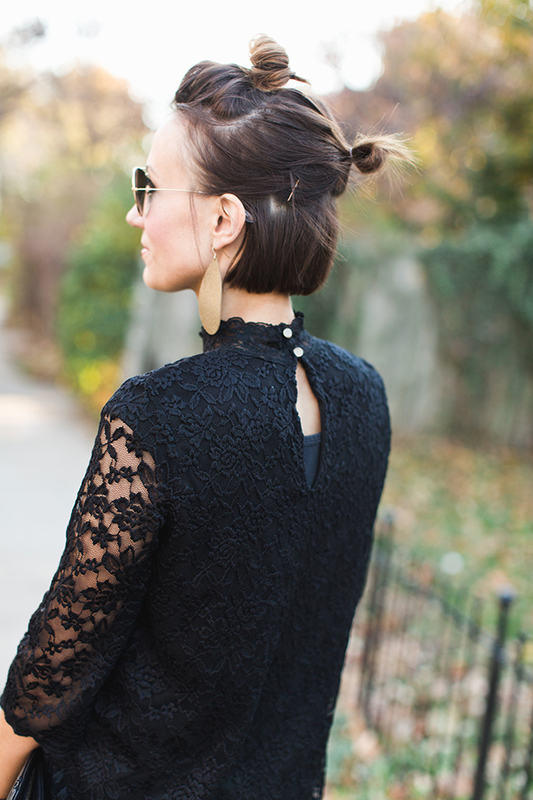 But it's the red shoes and this double topknot up-do that really take the outfit up to festive level. Have a great week and good luck with the last of your holiday prep! ** Thanks to Nordstrom for sponsoring this post. As always, all outfits, opinions, and thoughts are my own! That top is so pretty! And the shoes add the perfect pop of colour. 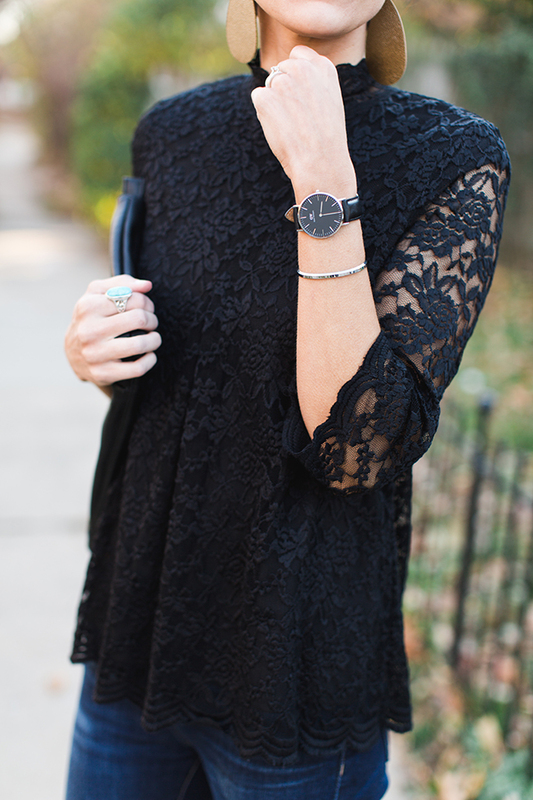 Love this lace top! Your hair looks adorable too!